This is a chemistry book like no other. This is your virtual consultant. If you work in any chemical company, our aim is to make this your survival guide. This is your portable consultant, available 24/7, and offering advice that cannot be obtained by cursory use of search engines. This consultant doesn't charge an hourly rate, has no ego, and is being constantly updated and improved upon. At no additional cost. In Part 1, The Portable Chemist's Consultant places particular emphasis on heterocyclic chemistry since this is the bedrock of society-shaping materials such as medicines and agrochemicals. Beautiful interactive graphics are designed to rapidly solve your problems by being both immersive and rapidly absorbed. In Part 2, a broad coverage of solutions to the most encountered problems and issues of industrial chemists is presented. We call it "speed consulting" - an amalgamation of dozens of commonly encountered problems and their best current solution. Finally, it features an extensive appendix with interesting topics for more advanced or specialized readers. All of the content is searchable with a built-in search engine. 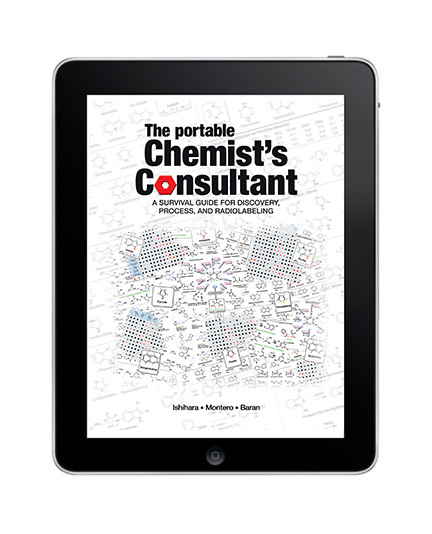 As alluded to above, The Portable Chemist's Consultant contains information that cannot easily be gleaned from online search engines and features objective advice to help navigate the ocean of data facing today's chemist. Our inspiration comes directly from the popular magazine Consumer Reports, run by a non-biased and non-profit organization to provide useful advice to consumers. In a similar vein, this book aims to save practicing chemists time, money, and frustration with simple advice often given in a rapidly absorbed graphical format. Advice is given with one sole criterion in mind: What would we do when faced with a similar problem? It is based on an extensive study of the literature, hands-on experience, and feedback from a decade of consulting in several sectors of industry such as pharmaceutical development, radiochemistry, medicinal chemistry, and agrochemistry. At the same time, this is an educational textbook based, in part, on a class in Heterocyclic Chemistry taught at the Scripps Research Institute for several years. Embedded videos from this class can be found throughout. This book was carefully created exclusively for the iPad featuring interactive figures, videos, and extensive hyperlinks to the literature. It will be suitable for both seasoned practitioners and newcomers alike. Best of all, it will be continually updated with new multimedia content, additional chapters, and tips even Google will not find. This book was designed with the reader in mind, and therefore comments, feedback, and suggestions for future updates to the book are most welcome.